Adequan Injectable for Dogs is an injectable medication prescribed to help manage arthritis and joint problems in dogs. It may also help restore joint lubrication, relieve inflammation and renew the foundation of healthy cartilage. For over 20 years, this medication has been prescribed and trusted by veterinarians to help moderate signs connected with non-infectious degenerative and/or traumatic arthritis of canine synovial joints. Adequan is recommended for the treatment of noninfectious degenerative and/or traumatic joint dysfunction and associated lameness of the carpal joint in dogs. Practice aseptic techniques in withdrawing each dose to decrease the possibility of post-injection bacterial infections. Adequately clean and disinfect the stopper prior to entry with a sterile needle and syringe. Use only sterile needles, and use each needle only once. View Adequan Drug Facts Sheet. The vial stopper may be punctured a maximum of 10 times. The recommended dose of Adequan® Canine is 2 mg/lb body weight (.02 mL/lb, or 1 mL per 50 lb), by intramuscular injection only, twice weekly for up to 4 weeks (maximum of 8 injections). Do not exceed the recommended dose or therapeutic regimen. Do not mix Adequan® Canine with other drugs or solvents. Contraindications: Do not use in dogs showing hypersensitivity to PSGAG. 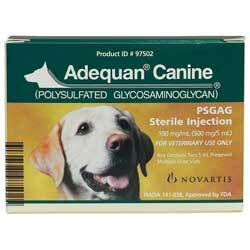 PSGAG is a synthetic heparinoid; do not use in dogs with known or suspected bleeding disorders. Precautions: The safe use of Adequan® Canine used in breeding, pregnant, or lactating dogs has not been evaluated. Use with caution in dogs with renal or hepatic impairment. Warnings: Not for use in humans. Keep this and all medications out of reach of children. Storage Conditions: Store at 20° to 25°C (68° to 77°F) excursions permitted to 15° to 30°C (59° to 86°F) (See USP Controlled Room Temperature). Avoid prolonged exposure to temperatures ≥ 40°C (104°F). Worked after first injection , gave my dog her love of swimming back .